The HART designer team has spent a long time looking for a way to create hard spinning lures for saltwater fishing, with an extremely lifelike finish. Looking at the lures on the market, they realised that the leading squid fishing equipment manufacturers were already using a specific technique: covering the lures with a fabric that was subsequently painted. So they thought: Why not do the same for spinning lures? 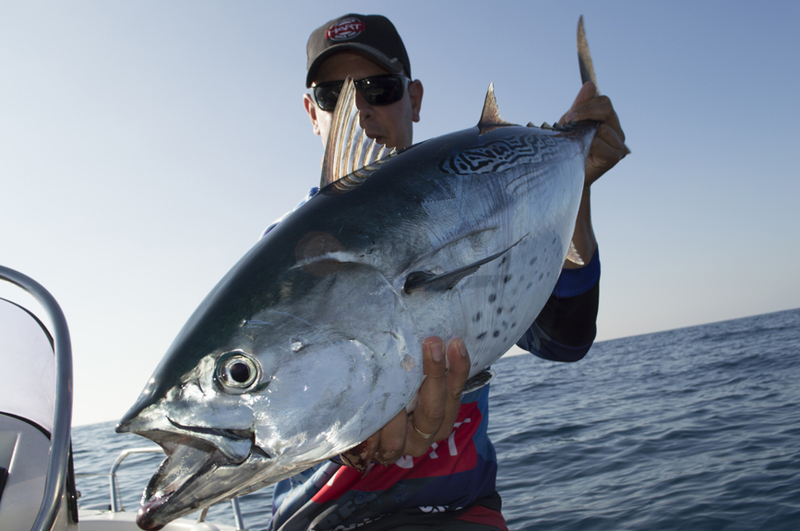 The SKIN family is the fruit of their work to design a lure that is as lifelike as possible. Their main achievements: a really natural outer finish, a very low frequency internal sound, natural movements based on rolling, and hooks that are invisible to fish. Ultimate technologies used by squid fishing lures have inspired the new HART SKIN lures, covered with a cloth layer. This cloth skin can be printed and treated in a more realistic way than the traditional painted hard plastic lure. Dressed to kill, attractiveness of SKIN lures for predators is considerably increased, together with its more naturalistic appearance. The lure has such very good hand feel that it makes it close to smooth. The dress of HART SKIN lures makes it possible to print any kind of pattern on them, increasing its fishing efficiency. In this way, lures can have cosmetics that are realistically simulating any fish bait, or either use UV or phosphorescent coated paints. Due to it ́s woven construction, SKIN allows it to be impregnated with long lasting flavours and scents, increasing again its attractiveness for predators. HART SKIN lures use new hi-end ASARI hooks, that have been specifically developed for these artificials. The new ASARI ACH range has modified the curves of traditional treble hooks to adapt them to the lure ́s body. The curves of each point have been designed asymmetrical to avoid hook tangling in the cloth skin. Moreover, torsion of the points keeps the edges ́ hooking abilities of ASARI ACH hooks as reliable as always. Why do we use white color hooks? According to photochromic research done in Japan, white color makes it easier for the hooks to be less visible by predators. If we consider that most of the attacks on the lure come from the bottom (from bottom up), white color hooks are more difficult to be seen due to the clarity and the way water shines on the surface with rays of light. There are currently 3 different models within the HART SKIN range. Each has been designed to meet the needs of a specific type of fishing. The Skin Caster is a "typical" jerkbait for topwater use with a highly pronounced rolling action during line retrieval. It features a double balancing system that allows for long casting, despite its 21 grams in weight, and long retrievals close to the breakers or shallow areas. It's also perfect for long topwater stops, imitating a fish in difficulty. Its extremely lifelike finishes guarantee bites, even when idle on the water surface. The Skin Minnow covers another type of saltwater predator fishing. This is a lipped lure which sinks slowly, in its stop and go action. Weighing 31 grams, it's perfect for long casting and, despite its short lip, it can be used at any water depth, dropping down with its Slow Sinking body until it reaches the bite area. Pronounced rolling with an extremely lifelike slight wobbling action. The Skin Bait is an extremely productive technical lure if you're looking for long casting. Weighing 36 grams, it can fly away as far as you want. Perfect for on-board shoal fishing with an extremely fast sinking action, allowing for frantic retrievals without coming out of the water. Like all models, it features a reinforced inner core, to make sure no fish is lost, whatever its size. They're perfect for mistreating them with all the saltwater beasts that may come our way.